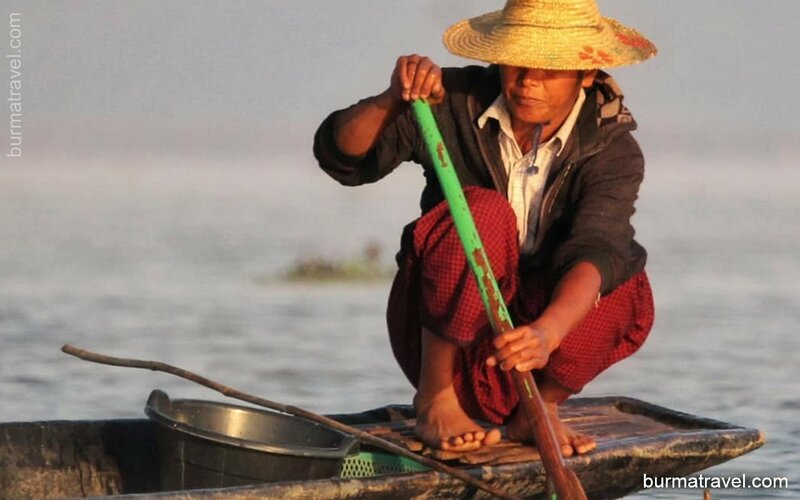 No longer the capital of Myanmar, but it has experienced a huge increase in tourism recently. Discover the unique beauty of Yangon with one of our specially picked sight-seeing tours. From the gold plated Shwedagon pagoda to its busy Scott market, we have all the excursions you need to discover Yangon’s awe-inspiring beauty and endless charms. PRIVATE TOUR COST: Prices are quoted in US dollars per person double occupancy. Myanmar Visa (more at www.burmatravel.com/visa/). Above prices subject to availability and subject to change. Amounts payable to third parties not included. International airfares not included unless otherwise specified. Please check all prices, availability and other information with your Burma Travel consultant before booking. Burma Travel general booking conditions apply. Mingalabar! 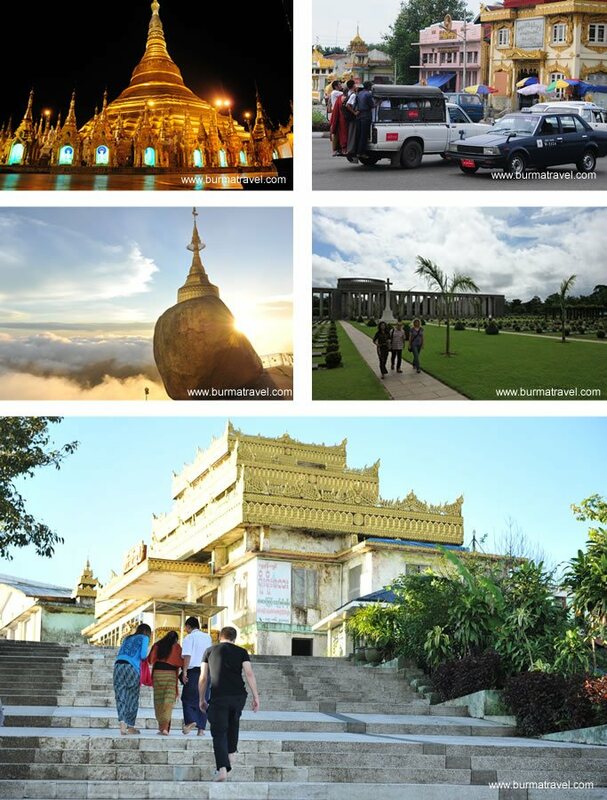 Upon arrival in Yangon, you are welcomed by guide and driver of Burma Travel. Your first Myanmar visit begins at Shwedagon pagoda, the most sacred Buddhism place in Yangon and also the oldest Buddhist stupa in the world. The pagoda cannot be missed in your city tour. Continue the tour to Sule Pagoda, another important Yangon landmark centrally at the bustling area. 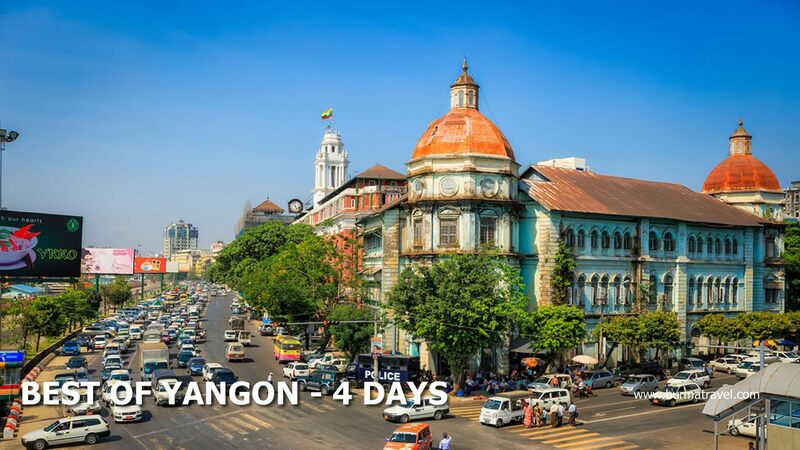 If time permits, we have the stroll to the exotic streets of Yangon downtown with the British Colonial building as Emmanuel Church, Inland Water Buildings. The day ends by your shopping time at the Bogyoke Market (formerly Scott’s market), one of the biggest markets in Yangon (please be advised that the market is closed on Monday and public holidays). Afterwards, check-in at your hotel and enjoy your time at leisure. Leaving Yangon in the early morning, we get ready for a journey to Kyaikhtiyo, the famous Golden Rock. This more than 2,500-year-old pagoda lies on the mountain top (3,615 feet – 1102 meters above sea level). Local legend believes that the power of the Lord Buddha’s hair keeps the Rock balance at the hill edge (even the earthquakes). After 5-hour driving, we arrive at the base camp of Kinpun Base Camp and go up to the Golden Rock by open truck (45 minutes). Finally, we have the light trek to the top and enjoy the sunset from this unforgettable site. After breakfast at hotel, we leave the Golden Rock for the Ancient City of Bago. It is known as Pegu, the Royal Capital of Myanmar. While in Bago, we visit the town market, 55-metre long reclining Shwethalyaung Buddha (the huge four sitting Buddhas). A stop at the Mon-style Shwemawdaw Pagoda is recommended. Before reaching Yangon, we pass by Taukkyan War Cemetery, the resting place of over 27,000 Allied World War 2 soldiers. Drive back to Yangon afterwards for hotel check-in. Then, you are free to discover the downtown on your own. Enjoy breakfast at hotel and free time on your own until your departure flight. Our driver will pick you up at hotel lobby and take you to Yangon airport. Please be aware that flight time, hotels and all others logistics, services and days of travel are subject to availability. Where flights are cancelled or delayed Burma Travel will endeavor to secure alternative arrangements of similar value as noted in our booking conditions. Did you know? Burma Travel can organize any additional accommodation. Call us on +8424. 3942 9444 to speak to one of our experts or click here to request a quote.